The Luggie backpack fits neatly onto the seat back of the folding mobility scooter. The backpack has a zip fastening and also has two convenient stick holders to place walking sticks or crutches. It is a perfect place to keep your belongings close by whilst out and about on your Luggie Mobility Scooter. The Luggie car bumper protector is ideal to keep in the car boot to assist you when lifting the lightweight Luggie Mobility Scooter in and out of the car. The rubber reverse will help keep the protector mat in place all the while protecting both your car and your Luggie Scooter. The in-car charging inverter is the latest accessory in the Luggie Mobility scooter range. This little device allows you to charge your Luggie lithium ion battery on the move so you never run out of power. Simply plug your Luggie charger into the inverter whilst you are driving to your next destination to give your battery an added power boost. The inverter is super efficient, safe and easy to use with lots of built in protection to provide peace of mind. You can even use it to charge other items such as your mobile phone. 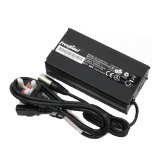 Power 300W, DC Input 12V, Output frequency 50Hz, AC Output 230V, output short circuit protection, auto-operation fan (heat/load) over load/ heat pre-alarm & shut-down, battery low pre-alarm. You can now conveniently charge your Eco Luggie Mobility Scooter batteries away from your scooter! Simply remove your batteries from the mobility scooter and using the Eco Off-board charging lead you can connect your charger to the batteries. Charging has just got even easier! Leave your Luggie Eco in your car or wherever you may choose to store it and simply disconnect the batteries. Small and compact to take with you on holidays. Specially made to fit the Luggie Standard, Luggie Eco and Luggie Elite mobility scooter this cushion is pure luxury. It has padded memory foam filler to ensure it doesn't lose shape and comes complete with a removable washable cover. With velcro attachments to secure in place, you can even flip the cushion up as extra back support. A neat bag which you can pull the Luggie along with when traveling. The New design allows you to fold it up and put it in a bag when not being used. The strong material protects the Luggie from scratches and bumps. When travelling with your scooter. 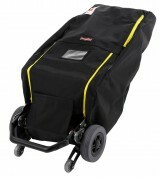 This travel bag is the newest addition to our accessory range for the Luggie Scooter. It is new in for the Super so now you can have peace of mind when you travel that your Luggie won't get damaged or scratched. It is made of hard wearing water resistant material and has red strips to make people mindfull of your Luggie. The zips either side of the bag make it very easy to put the Luggie in and out of the bag and it also has a fragile patch to ensure people handle it with care. The holes at the bottom of the bag allow your transporting and antitip wheels to stick out so that you can pull the luggie along in your bag with ease. 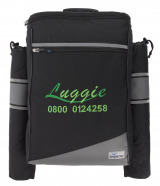 The Newest addition to our Luggie range - a compact protective bag to keep your luggie in for travelling and protects the scotoer from bumps and scratches when on public transport or airlines. 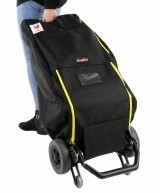 This travel bag is the newest addition to our accessory range for the Luggie Scooter. It is new in for the Super so now you can have peace of mind when you travel that your Luggie won't get damaged or scratched. It is made of hard wearing water resistant material and has yellow strips to make people mindfull of your Luggie. The zips either side of the bag make it very easy to put the Luggie in and out of the bag and it also has a fragile patch to ensure people handle it with care. Want to go even further in your Luggie Super Scooter? Then a spare lithium battery is for you. These mobility scooter batteries weigh just 3lbs and measure just 21cm x 18cm x 6cm so are easy to take anywhere with you. A Spare Lithium Ion battery is great for the more adventurous! Want to go even further in your Power Chair? Then a spare lithium battery is for you. These mobility scooter batteries weigh just 3lbs and measure just 21cm x 18cm x 6cm so are easy to take anywhere with you. A Spare Lithium Ion battery is great for the more adventurous! Team with the Luggie Backpack to keep your spare battery and other belongings in one place close by. 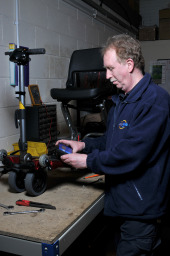 To support your 5 Year limited warranty we offer the 5 year service plan, giving you peace of mind that your Luggie Scooter or Chair is receiving the top quality care it deserves and ensuring the validity of that unrivalled manufacturers warranty. The 5 Year service plan has been designed to give you peace of mind that your 5 Year limited warranty is being maintained every year and saving you money too! 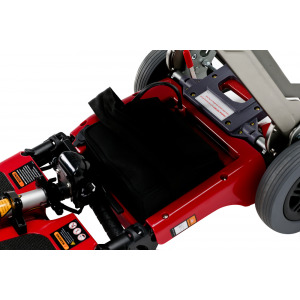 The service plan includes 4 services which will be carried out at the Luggie Scooters head office in Leigh in Lancashire. When your service is due, a friendly member of the team will give you a call and we can arrange to collect the scooter from your home. Simply pack your scooter into the original box (we can send you one out if required at no extra charge) and we will arrange collection to head office where our manufacturer trained engineers will carry out a top quality service and return your scooter to you all within a 3 day turn around. Terms and Conditions * The Luggie Scooters service plan includes FOUR annual services. The services must be carried out 12 months following purchase date and again at 24 months, 36 months and 48 months from purchase date. * The warranty will expire 60 months following purchase provided the services have been carried out at the required intervals. * The Luggie Service plan only applies to the following Luggie Scooter models: Luggie Eco, Luggie Standard, Luggie Elite, Luggie Super, Luggie Chair * Luggie Chair services will be carried out by an external company in the customers home unless the customer chooses to bring the scooter to the head office. It is not possible to collect the Luggie Chair from the customers home. * In accordance with the Consumer Contracts (Information, Cancellation & additional Charges) Regulations 2013 you have a 14-day cooling off period from the date of purchase to cancel the service plan. Any services declined will invalidate the warranty and cannot be refunded. * Any modifications to the scooter, or maintenance carried out by a non-authorised Luggie retailer can invalidate your warranty. Please contact customer services with any technical queries to prevent this. * The scooter service will be carried out at Unit 2-3 Commonwealth Close, WN73BD by qualified engineers. (applicable to the Luggie Eco, Standard, Elite, Super.) * Your scooter will be collected by a designated courier and is required to be placed into the Luggie Box before collection. If you no longer have the box please contact us so we can arrange to send you a box prior to the service collection. *not applicable to the Luggie Chair * Any warranty issues can be reported to the customer services team on 0800 012 4258.